“Overall, TestMasters was a really helpful prep course to review unfamiliar subjects in great depth. The notes were well organized and easily referenced if needed during the exam. The instructors for geotechnical, transportation, and water resources were incredible and outstanding. After attending these sessions, I really felt confident about each of the topics and my problem solving abilities”. “I am truly happy that I have passed the exam and Test Masters review course have made it possible”. “Thank you to you and your team for the course! I wouldn’t have been prepared to take the exam without having taking your course”. “Test Masters helped immensely in preparing me for the morning AND afternoon portions of the PE exam. I passed on the first time. From my experience, anyone wanting to pass the first time should take advantage of the Test Masters“course. I passed the exam. This was my 6th attempt at the exam and 1st for testmasters. A lot of the info I got from the course helped me reevaluate my approach to the exam and was used in this attempt. I passed the exam! I just want to let you know that I think your course is fantastic. I passed the FE and PE exams in the first time after taking your course. I have and will continue to recommend Test Masters to everyone I know that is attempting to take these exams. I would not have passed without it. I thought the course was very well done and all of the instructors were knowledgeable and prepared to teach each and every day. Thanks for helping me pass! I thought the material you provided was very helpful. The workshops were great since we worked out many problems. The test taking tips you provided were key. I passed my PE, thanks to Test Masters. I don’t think I could have done it without this course. The materials provided were right on with the test. Several of the questions where identical or very close to what I had in my notes. I strongly recommended this course to 3 EITs in my office. Thank you for everything. The Test Masters class was definitely the reason that I passed the test. The examples are very relevant to the exam. The class also serves as a great refresher for topics that I hadn’t visited in quite some time. I contribute passing the EIT and the PE to your course. I PASSED!! Civil-Geotech. I really gained a lot through the course. I Will be recommending it to anyone I can. I can say that, the Test Masters definitely helped me to pass the exam. I Passed! Thank you all so much for the excellent preparation. I would like to thank you for class you taught. I passed the exam with a score of an 82. The class was extremely beneficial. It taught everything you need to pass the PE Civil exam. The notes were thorough and the instructors were on their game. I did pass and I took structural in the afternoon. Thanks to Test Masters for this wonderful course. Definitively it was a great help. I passed! Test Masters works! and I have recommended it to a few of my friends who weren’t as fortunate to pass. review course was the right choice. played a huge role in me attaining that score. I chose structural depth for afternoon. I passed the PE in Civil engineering with Transportation afternoon depth. The course focused me in a way that I would not have been able to do on my own. Although in my original survey, I said I felt over prepared because of all the information in Testmasters, I would have tried to study even more books and concepts if I were on my own. I would have been completely overwhelmed without TestMasters. To me the course I received at TestMasters was essential, all subjects were dealt with in a very good manner. Happy to say I passed!!! I took the TestMasters PE Exam in Columbia, SC. Thank you for organizing the class. It was a great help!! I took the Construction depth exam in the afternoon. The course was fantastic for the morning section as I answered every question with confidence. I will definitely recommend this course to anyone taking the PE exam. and passed. The testmasters preparation course was an amazing support in my preparation for the exam. The professors were all very knowledge full and focused on getting us to pass the exam. I passed the PE exam in SC with the structural emphasis…Thank you to everyone at Test Masters for preparing me for the test. I was successful in passing the PE Civil engineering Environmental and Water Resources Depth exam in April. The course was extremely relevant to the exam. The advice was invaluable! I do not believe I could have been focused and organized enough to have passed without the course. Passed the exam with afternoon construction discipline! I’ve already been approached by a colleague asking for information about your review course. Thanks for all your help! Your class was extremely helpful, thank you for everything! I would highly recommend Test Masters to anyone who is taking the PE. I passed the FE exam last Oct (6 months after taking TM FE prep course) and I passed the PE exam in April. Thank you for your help! After 25 years in industry the TM course was crucial for spinning back up on all exam concepts…I sent one of my colleagues to your PE course and he too passed. Thank you so much for the instruction that I had received from Test Masters. As a foreign engineer taken for the first time the PE test, it was really important to do a review course, and I believe your course focused in the most important aspect for the evaluation I have passed the PE test with a score of 87. I took the Civil PE exam (Transportation depth). I received a passing score…I believe the review course was a great help in passing the exam. The topics covered in the course were relevant, and the supporting workshop material was helpful in my preparation. Thanks for the advice and great review course. Thank you and Test Masters for giving me the tools to prepare to take this examination. The first time I took the exam, I knew that I needed more preparation and Test Masters cleared up all doubts I had. Thank you very much for all advice!! 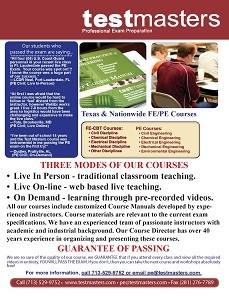 I took the FE prep course and recently took your PE prep course for the April 2012 exam. I am in Mississippi. I passed and I know Test Masters is a big reason for that…You all do a great job at consolidating the information. I think that was a big key… All and all, your class was great. Thanks again. it to all my co-workers that are E.I.T.’s and will be taking the test soon. Finally I am done…I have to say, without the course material you provided, I would have never passed… Thanks for your help. I passed the PE! I couldn’t have passed the first time without the class. Thank you so much! Prior to this, I took the Civil PE Exam in October 2011 and I did not pass. I was very disappointed. One of my colleagues from the Society of Women Engineers recommended that I participate in the Civil Test Masters course because she was able to pass the PE exam when she took the course. I am happy to report that I passed the exam on my second try with a score of 86%. Previously, I made a 61% in the exam. My PM depth for April was Geotechnical. The PE Civil Test Masters is a wonderful program. I have recommended to their colleagues at work who are taking the PE exam in October 2012 to consider this program to assist them with preparing for the exam. The instructors, course notes and testing strategies helped me tremendously on exam date…Because of your program, I have passed the PE exam and I will be receiving a promotion. I passed the PE exam (water resources) with a 92. I feel like the course prepared me very well for the exam. The only material I used to study for the exam was the Test Masters material and the NCEES practice exam. I felt the material was right on track with what the exam had. I think the test was actually easier than most of the practice problems from the course. Thanks for all of the help in preparation for the exam. I would like to thank you and your organization of the Test Masters course…Your course did an excellent job of focusing me on the items commonly tested on the PE Exam. I am very pleased to pass the exam on the first try and have recommended the course to others preparing to take the exam in October. presented are very well-aligned with the type of questions that can be expected on the PE exam. without your valuable help, I would not have been successful in this undertaking. I know this sounds shallow, but really—words are not enough to express my utmost gratitude for all the help you have extended to me. I passed the Water Resources Depth… I believe the class was very beneficial and aided greatly in providing a format for the exam as well as great reference material which I utilized in the exam. Thanks. I passed the PE Civil/Water Resources & Environmental exam with a score of 87! Your class is awesome, and ever since I completed the course, I have been recommending it to every engineer that I know that is planning to take the PE exam. Given the short period of time that I had to prepare for the exam, unless I got very lucky, I would not have passed if I had not taken the course. Thank you so much for offering this course. The instructors were great! Keep up the great work! PASSED!!! My score was an 89, and I took the Structures PM .Taking the course was the best decision for passing. I could not have been better prepared for the morning. I was very happy during the exam, seeing how quickly I was able to answer questions and look up formulas using the class notes. I PASSED, First time! I’m glad I took your course. The course made it easier to recall subjects that I had not seen since college. Thanks! Resources and Environmental. After being out of school for 11 years, I know I couldn’t have done this without Test Masters. I didn’t study anything outside of the notes in the binder. Thank you so much!! I’ll continue to recommend your course to my colleagues! I passed with an 81. I took the Geotechnical PM exam.. Test Masters was an excellent prep course… I will be recommending your course to every EIT. Thank you for the help. Thank you very much for your help as I could not have done it without the Test Masters course after being out of school for over 26 years. I passed the PE Exam.. This was my first attempt at the PE Exam. Your PE review course was definitely beneficial to me in preparing for the exam. It was exhausting going through it but 100% worth it… Thanks for preparing us so well. I passed the PE exam (Water / Environmental PM)… I had been out of the workforce for 12 years …Every time I opened the Lindeburg book I would feel more out of my depth. I finally decided to wait to study until I started the Test Masters class. The classes made me feel much more confident in my abilities. I know that Test Masters is the reason that I passed. Thank you for the excellent course. Your class was a huge helping tool in me passing my exam!! All of the topics that were covered were so helpful on the exam; most of the professors/lectures were great and covered what needed to be covered on the exam. I thank you so much! !..The little helpful tips and tricks were great and allowed me to get through the problems quickly and saved me time for other harder problems. I passed the PE exam in Alabama, afternoon depth: water resources…Thanks to all the Test Masters teachers. I would have never set aside that much time to study on my own. I passed the PE exam. Thanks again for the help. I have recommended your services to several others in my company and will continue to do so. I attended Test Masters FE General Review Aug-Sept 2010. Passed Oct. FE exam on 1st try. Attended Test Master PE Civil Exam review Jan. – Feb 2011. Passed April 2011 PE exam on 1st try. Could not have done it without you. This was my first time taking the test, and I believe I was successful thanks to the review course and hard work on my side to meet the recommendation instructed in class. Hooray, I passed! Your course was most relevant to the exam especially the breadth material. I could not have passed the exam without your course. I hate to admit it, but I never worked a single problem outside the course sessions. I have passed the Civil/ Construction PE Exam. Again, thanks to all the instructors for taking this course seriously; I would have been very unprepared without it. Thanks so much! I couldn’t have passed without Test Masters! relevant to the exam questions. time outside of class proved successful. Hi, Thanks for such a great course, couldn’t have done it without you! I passed the PE, thank you very much for the very helpful course. I think it was an excellent course. I thought the class was excellent and it really helped me in preparing for the exam. I have passed thank you so much for the wealth of information. I know that I would not have passed if not for your class. I tried the exam many times, but it is all worth it now. I passed (transportation)!!! I am so glad I too this class- I didn’t have much to study) I am the mother of two small children and work full-time), and this course really forced me to focus.